The Johnstown Tomahawks, once again, swept the Wilkes-Barre/Scranton Knights over the weekend, 4-1 and 3-2, to keep their playoff hopes alive. 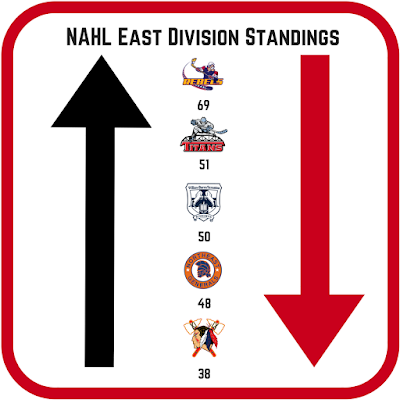 So how can the Tomahawks make the playoffs having been in fifth place basically for the whole season and still sitting back ten points behind fourth place Northeast Generals? Well, it's two fold. Win. Hope Northeast or New Jersey doesn't. 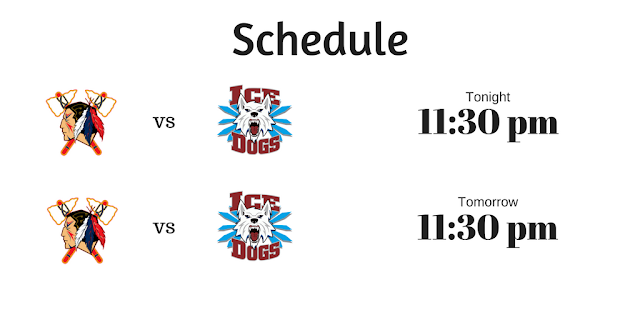 Johnstown has a total of eleven games left in the 2017-18 regular season. 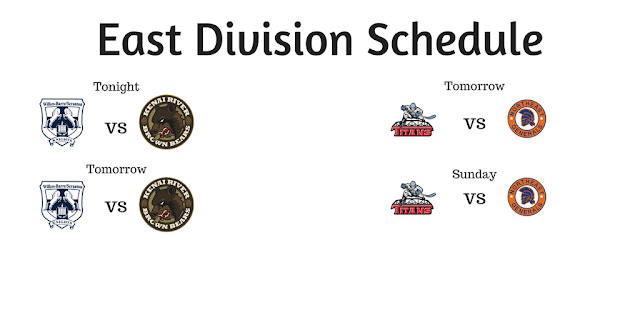 These eleven games are going to be the biggest regular season games that the Tomahawks have possibly ever played. 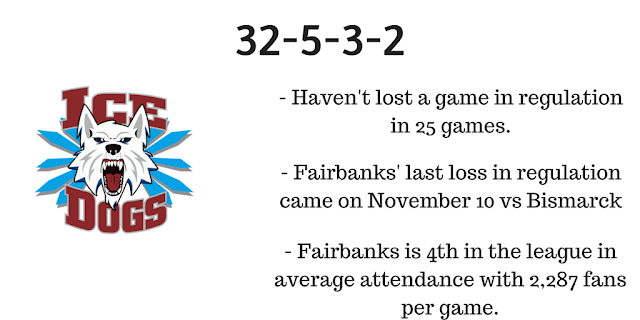 It's a tough task, but if they buckle down and play like they did this past weekend, they have a chance to take care of business, at least on their side of things. 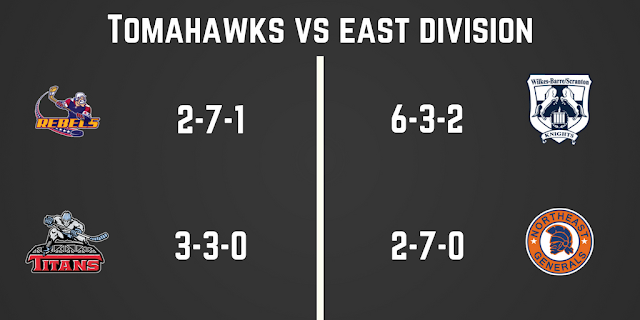 Looking at the points in the East Division, this is how things break down. The Tomahawks have an off week this weekend. They will then play three games at New Jersey. The following weekend, at home, for three against Northeast. Then back to New Jersey for three more. 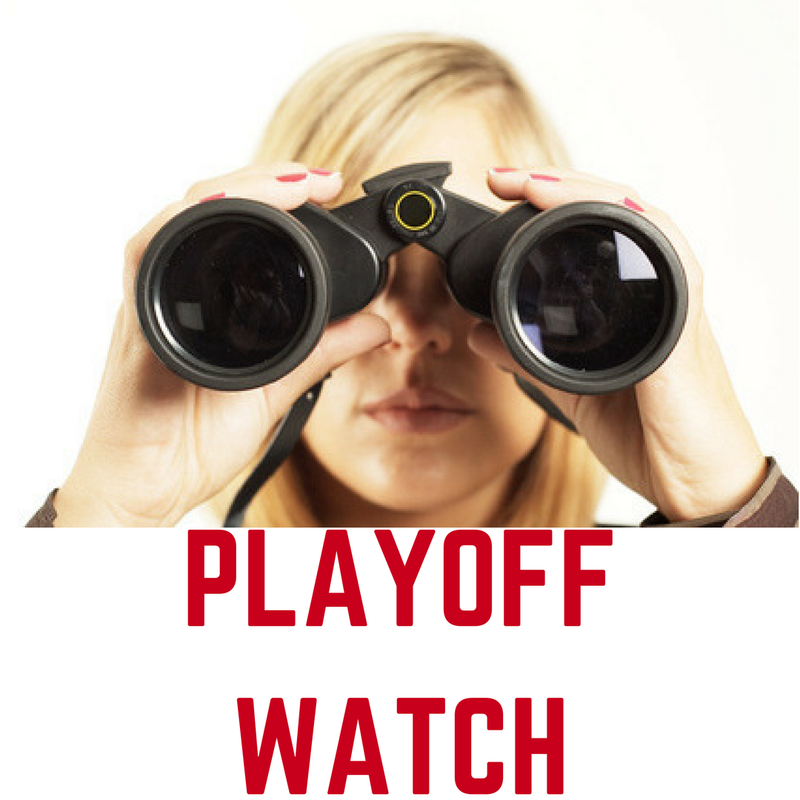 The season comes to an end at home with two games vs Philadelphia. 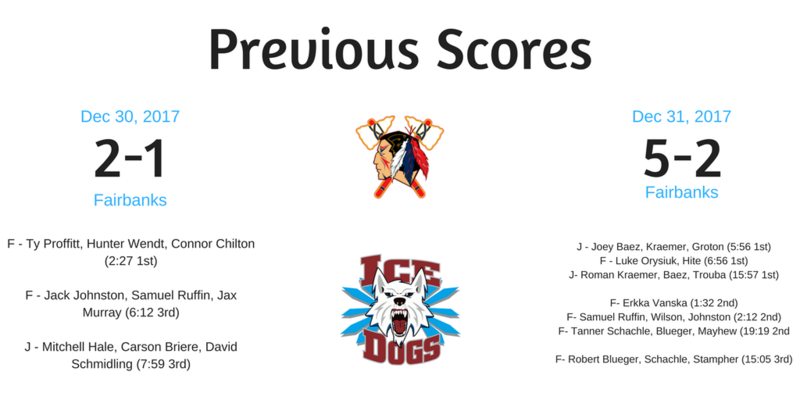 If the Tomahawks don't put together a Hollywood ending to this year's season, then this will be the first year in team history that they won't make the playoffs. 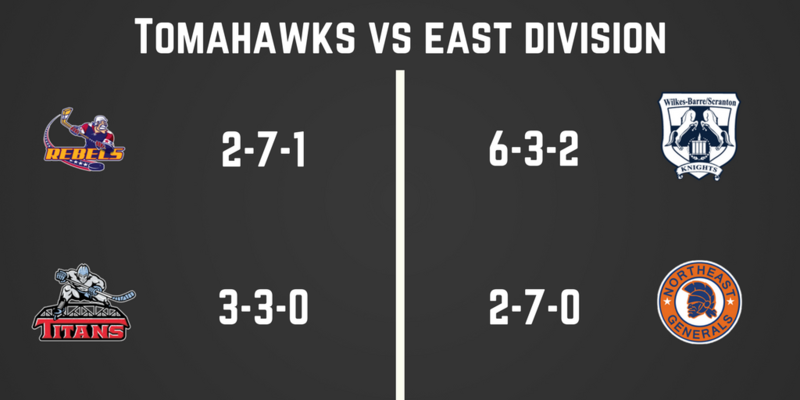 The Tomahawks best record vs an in-division team comes against the Knights this season, as you can tell from the image below. Too bad we don't have any more games against them. 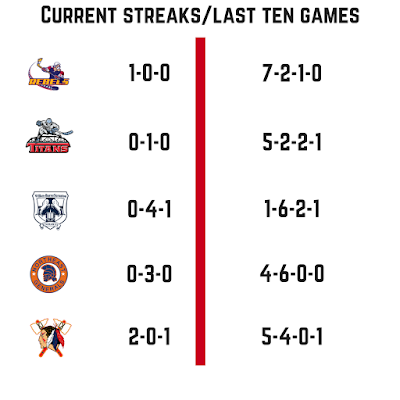 One bright spot is that the Tomahawks are one of the better teams in the division in their last ten games. 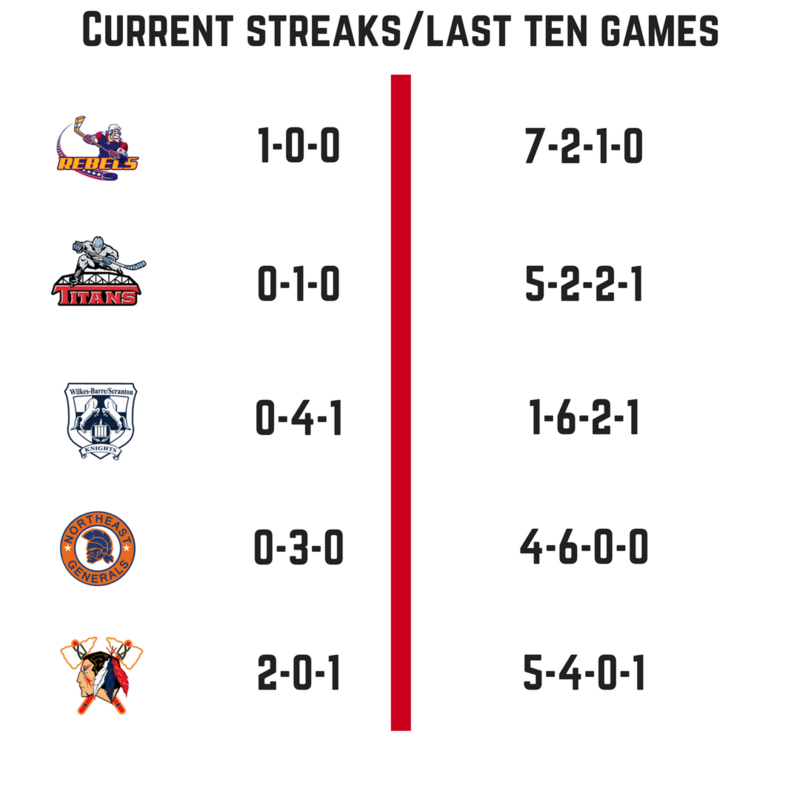 Here are the team's current streaks and records in their last ten games. 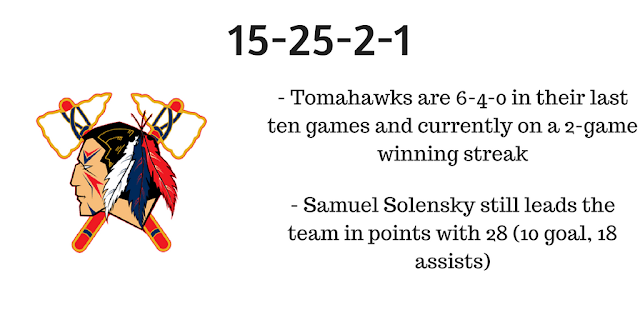 The most points the Tomahawks can add is 22, that's if they win their last eleven games. In total that would give them 60 points. 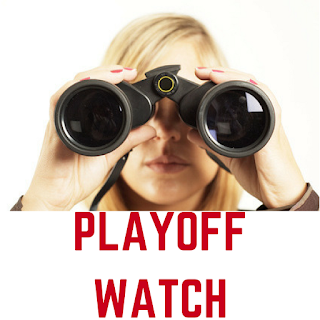 Remember, four out of the five teams in the division make the playoffs. 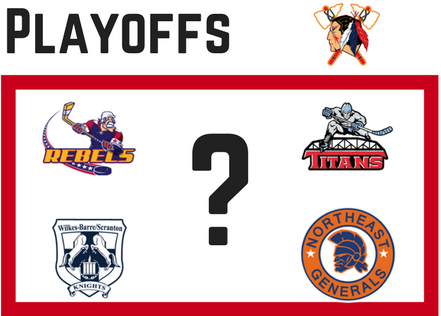 So, since the Generals are the closest to the Tomahawks, our breakdown will look at how many games Northeast has to lose for Johnstown to take over the last playoff spot. Quickly, let's look at the Generals remaining schedule. 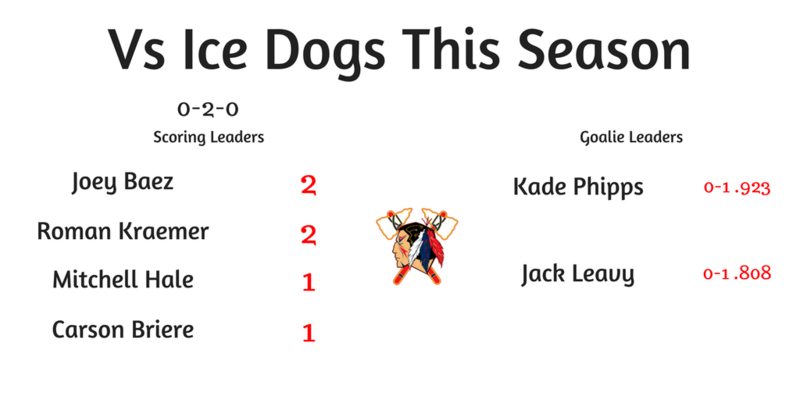 With the Generals ahead of Johnstown by ten points, it's very important that Johnstown sweep the Generals when they face them in a couple of weeks. 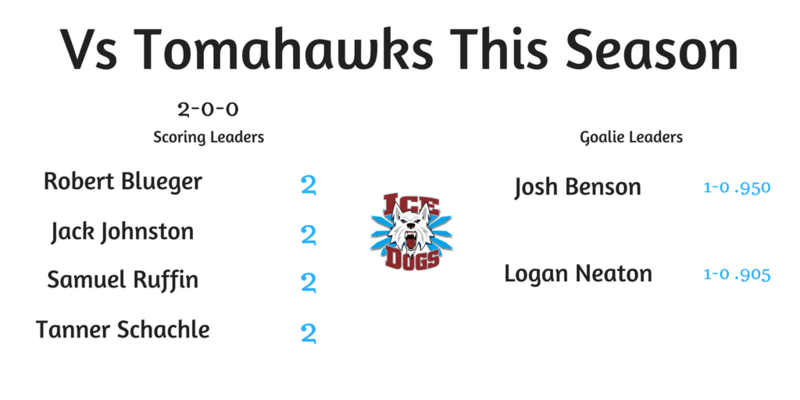 With it being three games, with two points each, that would give Johnstown six points, bringing them only four points away from tying the Generals. But, the Generals have played three less games than the Tomahawks. Let's work our way from the max amount of points the Tomahawks can get (60), down, to see what each team's reocrd would have to be for the Tomahawks to still make the playoffs, and Northeast not. 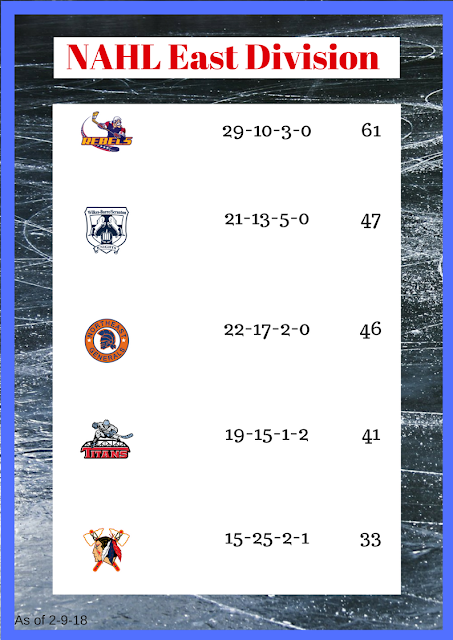 As you can see, if Johnstown would somehow go 11-0-0 the rest of the season, Northeast would only have to go 6-8-0 for Johnstown to tie them in points and I'm not too sure what the NAHL tie breaker is. Reminder: This is only looking at the easiest solution. If New Jersey falls apart and Johnstown plays great, they could knock New Jersey out, but we'll take a look at that possible angle as the last few weeks move along. I'll try and update this chart after every game to give you an up-to-date look at the Tomahawks' chances. You'll find those updates on The Tomablog's social media pages. So, do you think the Tomahawks will overtake Northeast and make the playoffs? 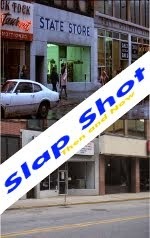 Let me know with a comment here on the blog or on our social media pages. Links to those are below. It's going to be an interesting end to the season for sure.